A portable free standing advertising sign designed to be placed on the ground. If you use these signs on public land or highways then please comply with the rules below. Why do we need rules for their use? Not sure if your A-board complies with the rules? Over the years the number and size of A-boards used by businesses on footpaths has increased. The Council has adopted a policy in relation to the placing of A-boards to reduce the number which cause obstacles to pedestrians, disabled people, particularly people with visual impairment, and people with pushchairs sometimes have difficulty getting around them. Your business must act in accordance with this policy or your board will be removed and you will have to pay a fee of £100 + VAT to release it. The policy only covers A-Boards (portable free standing advertising signs designed to be placed on the ground), and mainly in respect of their size and position (see rules below). These clear rules, so that everyone understands the requirements of the policy and are treated equally, have been agreed with the support of the Bath Improvement District (BID) and the Chamber of Commerce, and were first published in 2012. The rules apply throughout Bath and North East Somerset. Use only one board per property frontage. Place it against the frontage or property boundary. You must leave a minimum of 1.5 m width of footway for pedestrians. If this is not possible then you cannot position an A-board here. It must be no bigger than 660 mm wide and 1250 mm high. Vibrant colours will not be appropriate in the Conservation Area and close to listed buildings where more traditional subdued colours and type-faces will be required, with modestly sized lettering and well-balanced design. (Planning Officers to adjudicate this). It must be freestanding and not chained or tied to street furniture. It must be stable and not weighed down by sandbags. It must not have any sharp edges. Swinging and rotating boards are prohibited. It must not carry any offensive or political message. It must not obstruct visibility at junctions. It must not be put out before 9am to assist regular street cleaning. It must be removed from the street when the property is closed or other street cleansing work is taking place. It must be covered by the owner’s public liability insurance. A-boards may need to be removed during severe weather, events, to permit maintenance or street works or for other reasonable cause. Any additional requirement requested by the Divisional Director – Neighbourhood Environmental Services, the police or emergency services, including immediate removal of any item, must also be complied with. We may visit any business whose A-board doesn’t meet the rules to explain why and ask you to remove or reposition your A-board. It is an offence under Sections 137 and 148 of the Highways Act 1980 to wilfully obstruct the highway without lawful excuse. Sections 143 and 149 give the Highway Authority powers to remove any items which have been place on the highway. If your business does not comply with this policy then our officers will remove your board. You can collect your board for a flat fee (currently £100 + VAT in 2016). We will store your board for 3 months and if you do not pay the fee and collect your board within this time we will destroy it. Please note that any liability arising from an accident involving an A-board remains with the owner of the A-board. Any damage caused to the A-board in removal must be covered by the owner's insurance. If enforcement action has taken place and your A-board(s) has been removed you will have already been spoken to by an officer of the Council and be in receipt of a ‘Reason for Removal’ form. 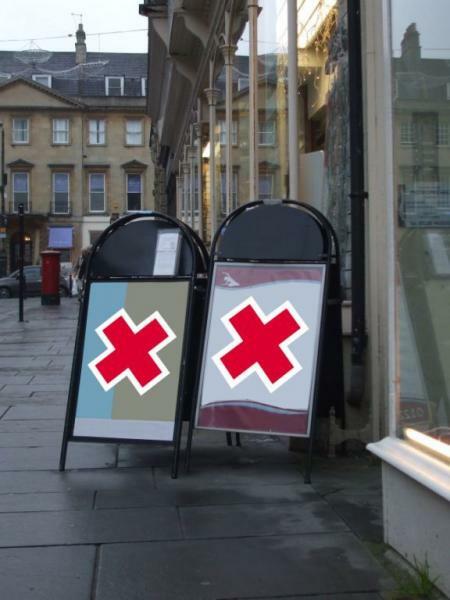 Your A-board(s) will be taken to Midland Road Depot, Bath. Visiting one of our One Stop Shops at the Civic Centre, Keynsham, The Hollies, Midsomer Norton or Lewis House, Bath. When collecting your A-board(s) you will need to report to the Reception at Midland Road Depot, Waste Collections, Upper Bristol Road, Bath BA1 3A. This is the refuse collection depot. Please note this is not the public weighbridge or the public Recycling Centre. Pedestrians can access through the main gates opposite Royal Victoria Park and the depot building is on the right hand side. Please note there is no public parking on site. There is on street parking at Midland Road next to the Bristol and Bath Railway Path; Upper Bristol Road; Royal Victoria Park. You may only collect your A-board(s) between 9am – 12.30pm, Monday – Friday. You will need to take the appropriate reference/receipt with you to prove you have paid. There will be a short delay whilst the A-board(s) is brought to you from the storage point. A-board(s) must be collected within 3 months of removal or they will be destroyed.